For those of us in the Northern Hemisphere summer is slowly winding down, but it’s not over yet. Think of those hot, windless summer days, and how sluggish we get. Computers aren’t so different, but instead of going for a swim or reaching for a cold beverage, they shut down. Avoiding overheating in industrial systems is critical to their long-term reliability. For systems expected to run 24/7, minimizing downtime is essential. Having a system overheat and shut down can cause serious problems, both for the application in the short-term and for the longevity of the system itself. A number of methods exist for keeping a system’s temperature down. The most familiar to end users will be the dedicated cooling fan. Either in the case or on the board itself, fans provide air flow within the case via mechanical convection, moving air over and away from heat-generating components through vents in the chassis. The drawback to this tried-and-true method for cooling traditional computer systems is noise. Among low-power systems, a simple heat sink is often enough, provided there is adequate ambient airflow through the case. For many industrial and mobile applications, systems are expected to operate in hot and dusty or vibration-prone environments where fans are impractical. Fans require ventilation, exposing the system to dust and debris; furthermore, fans are delicate, and fan failure due to vibration or clogging would result in unacceptable downtime of the system. In the past, users in harsher environments were stuck with off-the-shelf desktops, which were limited by size and ventilation constraints, and which were prone to failure. In recent years, these suboptimal solutions have given way to a new breed of purpose-built fanless systems: rugged, reliable, and able to withstand temperatures and environments that their predecessors could not. 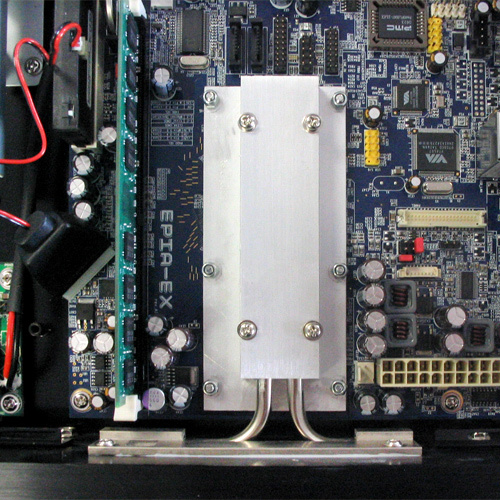 In such fanless or passively-cooled systems, a heat sink or heat pipe pulls heat away from the chips on the board, putting them in contact with “fins” on the surface of the case. So what are the fins for? Effective dissipation of heat in passively-cooled systems requires surface area. Adding ridges to the case exterior provides more usable cooling space, essentially turning the whole chassis into a giant heat sink. This is one of the reasons fanless systems are often hot to the touch, and why they should be: the delicate components on the inside are what need to be kept cool. The surface area factor is also why there is a limit to how small fanless systems can be, and where they can be installed. There is a point at which an enclosure becomes too small to provide adequate surface area, and a fanless case must be supplemented with ventilation. Even with enough dissipative area, heat still needs somewhere to go. To get the most out of these specialized systems, there must be some degree of air flow across the surface of the case. The effectiveness of a system’s cooling is only part of the solution. A common misconception is that any small form factor board is a candidate for fanless, embedded deployment. It’s true that Mini-ITX and other small form factors were developed for ultra-low power embedded systems. The obvious benefit of a smaller footprint offering all the features and functionality of a full-sized desktop has led to more mainstream boards featuring desktop-based processors for consumer applications. They make an appealing proposition: who wouldn’t want more performance in less space? These processors may offer higher performance than embedded and low-power options, but it comes at the expense of a significantly hotter package requiring more energy to run. 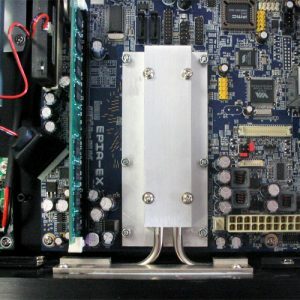 As a result, we typically shy away from deploying desktop-based boards in fanless enclosures, where the risks of overheating and component failure are magnified by a hotter CPU. Enthusiast-grade performance deserves enthusiast-grade cooling, most of which is only available in consumer enclosures which do not meet the criteria of small footprint, quiet, discreet, or rugged. Luckily, low-power embedded boards are rapidly approaching the performance point at which there is very little tradeoff between them and desktop-based models. The new Sandy Bridge Mobile products from Intel are paving the way for a higher-performance generation of energy-efficient products. Lower-TDP packages intended for use in fanless or rackmount systems will continue to lead the way in industrial computing; they’ll just get more powerful. Interested in learning more about our fanless systems or trying one on for size? Check out the Fanless System section on our website to see the range of available platforms.